In the past, many traditional banking organizations looked at fintech start-ups as more of a nuisance than a threat. Today, many are viewing these non-traditional providers as a threat as well as either a partner or potential acquisition. 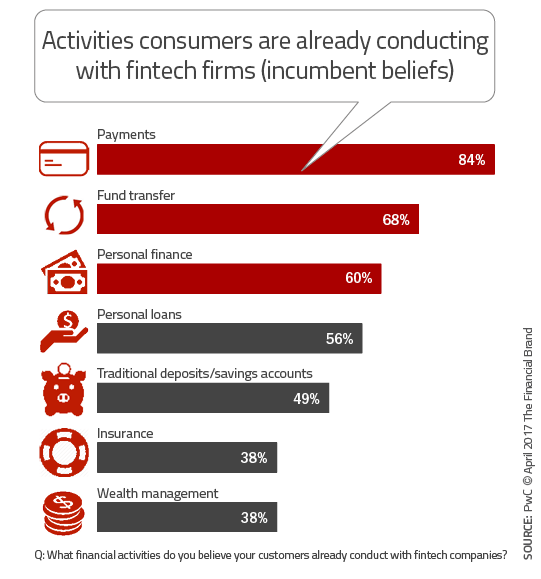 In its latest Global Fintech Report, PwC found that 88% of legacy banking organizations fear losing revenue to financial technology companies in areas such as payments, money transfers and personal loans. The amount of business at risk has grown to an estimated 24% of revenues. Fintech startups realize that it takes more than a great solution to attract a scalable customer base. To reach beyond early adopters and the tech-savvy takes massive amounts of capital for promotion and product support. Partnering with an established banking organization who will support the expansion of users among their client base seems like a logical means to an end. Alternatively, legacy banking organizations, struggle to keep up with consumer expectations. Size, organizational structure (silos) and even traditional leadership styles hamper the ability to deliver the new digital solutions consumers receive from other industries. Partnering with a fintech startup alleviates some of these issues, allowing the established organization an opportunity to keep pace with marketplace demands. Fintech collaboration is not about grabbing for the ‘next shiny object’ — it’s about intuitive product design, ease of use, and 24/7 accessibility. Despite increased adoption of digital payments, cash remains a primary form of payment for many, especially for low-value transactions and by certain demographic groups. Attributes of cash contributing to continued use include speed, universal acceptance, anonymity, lack of fees, etc. Some emerging markets also still lack a modern payments infrastructure while certain cultures don’t have trust in the banking system. In other words, the reports of the death of cash are still exaggerated. 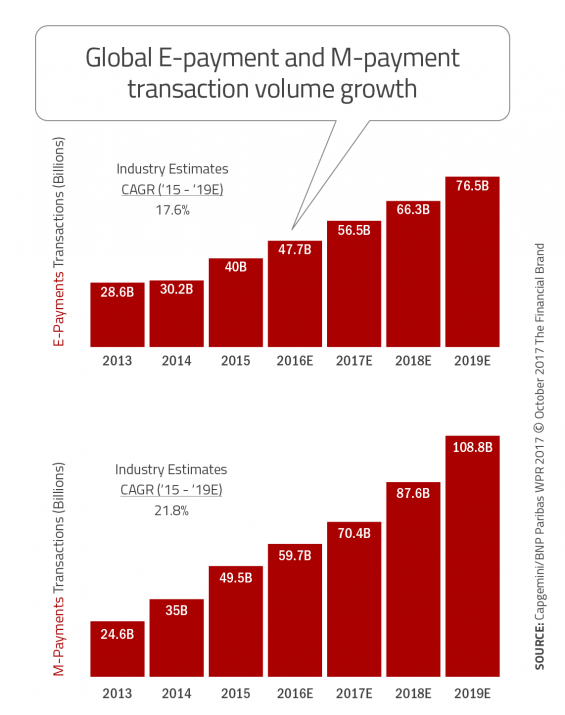 While e-payments are expected to grow at a CAGR of 17.6% from 2015 – 2019, the yearly growth rate is expected to decrease, as more transactions move to mobile payments (m-payments). Mobile payments are expected to have a CAGR of 21.8% from 2015 – 2019, helped by an increased proliferation of mobile devices. As with many of the payment trends, the impact of China on growth numbers is significant. The integration of customer analytics, improved fraud management, dynamic wallet solutions and other value-added services will have a positive impact on both the consumer and the merchant. It is expected that ongoing improvement in biometrics and secure payments will become mandatory in the future, while integration real-time financial management solutions will become commonplace. Finally, as fintech firms continue to bypass traditional value chain components, traditional financial services organizations will need to determine if they should partner with, buy or ignore these new competitors. Given that most of the fintech activity in the payments space has targeted the most lucrative components of the payment value chain, significant decisions are necessary. There is no clear path to success in the new payments ecosystem, with many variables, opportunities and challenges still in an embryonic state. It does seem to be clear that success will require collaboration between players and markets. Especially as new technologies and new structures of solutions emerge in connection with open banking APIs, AI and big data, organizations will need to determine their best role in the new ecosystem. In the end, the consumer and commercial marketplace will determine the winners, but there are tremendous opportunities for firms that embrace collaboration of insight and solutions to develop an improved value-added proposition that can address the need for speed, insight and security.